NEWPORT, RI – A Candlelight Concert of Remembrance will be held on Sunday, Nov. 11, 2018, at The Zabriskie Memorial Church of Saint John the Evangelist, 61 Washington St. (corner of Washington and Willow streets) at 4 p.m., reception following. The concert is held in observance of the 100th Anniversary of Armistice Day. 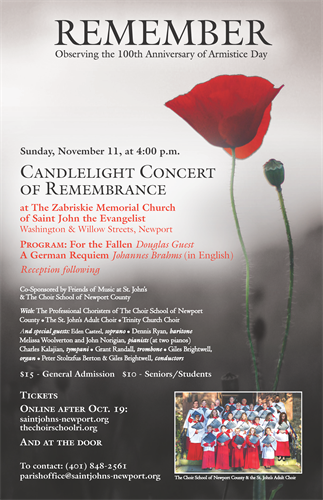 The Professional Choristers of The Choir School of Newport County, the St. John’s Adult Choir and the Trinity Church Choir, with special guests, will perform For the Fallen, by Douglas Guest, and A German Requiem by Johannes Brahms (in English). Co-sponsored by Friends of Music at St. John’s and The Choir School of Newport County, general admission is $15, $10 for seniors/students. Tickets are available at brownpapertickets.com by searching “Candlelight” or through this link: brownpapertickets.com/event/3741703, and our Facebook event page is: facebook.com/events/338304400262133/. Free parking is available in the church lot opposite 25 Willow St. The Zabriskie Memorial Church of Saint John the Evangelist, 61 Washington St., Newport. Corner of Washington and Willow streets. Sunday, Nov. 11, 4 p.m.